Sleep apnea makes it impossible to get the restful, restorative sleep your body and mind need. Sleep apnea treatment at NYC Smile Design can alleviate these episodes. Dr. Elisa Mello and Dr. Ramin Tabib will work collaboratively to develop the treatment plan that will be most effective for condition, helping restore the quality sleep you need to function at your highest level. If you have been diagnosed with obstructive sleep apnea in New York, we may be able to provide you with CPAP-free treatment options. Call 212-452-3344 to schedule an evaluation at our Manhattan office. NYC Smile Design welcomes patients from all areas of New York City as well as surrounding communities in New Jersey and Connecticut. Why Choose NYC Smile Design? 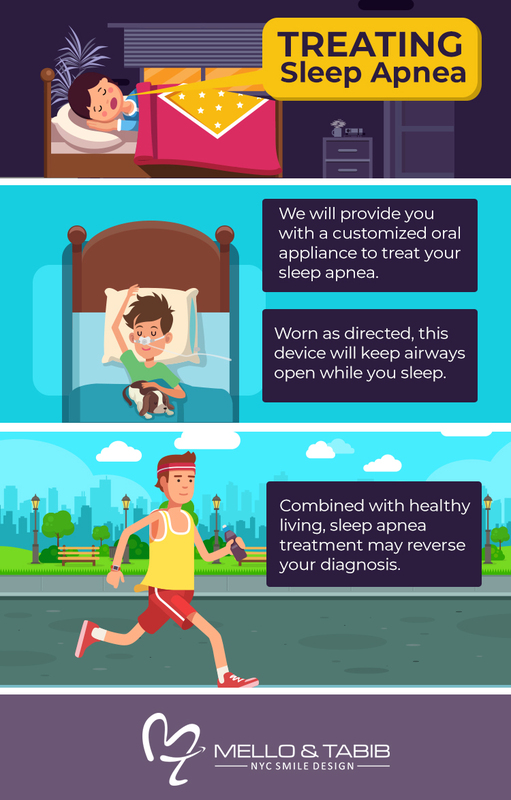 Contact Us to Learn About Sleep Apnea Treatment Options. Sleep apnea is a sleep disorder in which you stop breathing several times throughout the night. Each episode may last from just a few seconds to as many as 30 or longer and is often accompanied by choking or gasping sounds when breathing resumes. Sleep apnea occurs because the airway is not open all of the way. Oftentimes the airway blockage is caused when the muscles of the throat relax, causing a partial or complete obstruction. This is called obstructive sleep apnea (OSA). OSA is sometimes treatable through noninvasive dental treatments available at our office. Central sleep apnea, which is related to interrupted signals between the brain and the muscles of breathing, is not treatable through dentistry and will require the assistance of a physician or somnologist. If you have been diagnosed with OSA and are looking for an option that does not involve machines, tubing, and masks, Dr. Mello and Dr. Tabib may be able to help. Give us a call today to schedule your consultation and learn more. If it has been brought to your attention that you snore loudly or if you have been made aware of choking and gasping sounds you make while sleeping, you may have sleep apnea. If persistent, these symptoms should be brought to the attention of your primary physician. Sleep apnea is diagnosed by a physician or somnologist, typically based on data collected through special equipment while you sleep. This equipment monitors airflow, heart rate, and blood oxygen levels, providing your physician with information about the quality of your sleep. This information will enable your doctor to make the appropriate diagnosis. Though our dentists do not diagnose the condition, we can provide you with a take-home sleep test - the results of which can then evaluated by a qualified doctor. Most people with sleep apnea do not realize they have it. Oftentimes it's a partner, spouse or housemate who notices you are gasping or choking in your sleep. If you suspect you have sleep apnea, call your doctor right away for testing and diagnosis. If you are diagnosed with OSA, visit our New York office to learn if we can help you find a safe, comfortable, and effective treatment for your condition. CPAP is effective, but many people find it uncomfortable. If you have OSA, it may also be entirely unnecessary. CPAP, continuous positive airway pressure, is a common treatment for both obstructive and central sleep apnea. These machines provide a continuous flow of oxygen during sleep, helping to prevent breath cessation. Oxygen may be delivered through tubing in the nose or a mask worn while sleeping. Our dentists offer a comfortable oral appliance to treat obstructive sleep apnea. Worn while you sleep, these devices maintain an open airway by angling the lower jaw and gently moving the tongue forward so that they do not obstruct the airway. Treating OSA with an oral appliance can also help keep soft tissue in the palate and throat from collapsing to further prevent breathing obstruction. Another treatment approach is to expand the dental arches with orthodontics (braces or Invisalign®). Doing so creates more room for the tongue, so that it does not relax into the airway, and positions the jaw forward for better airway flow. The best way to determine which option is right for you is through a one-on-one consultation with our experienced New York dentists. Is a diagnosis of OSA permanent? That depends, at least in part, on you. Treatments may be effective at holding airways open, but many of the causes of OSA are related to lifestyle choices. If your condition is related to lifestyle choices, you will need to address those for long-term success. Continuing to do those things that cause sleep apnea will limit the efficacy of treatment efforts. Leading a healthy lifestyle may be necessary for lasting results. The risks of untreated OSA are too great to ignore. If you suspect you have sleep apnea or if you have been diagnosed but have yet to seek treatment, contact us today to schedule an evaluation and learn how we can help. Founded in 1995, NYC Smile Design is dedicated to providing men and women in Manhattan and beyond the most advanced and effective treatments available. With OSA, this extends to oral appliances that have a standing record of comfort and efficacy along with lifestyle recommendations based on years of observation, study, and personal experience. We care about each patient we treat and will take time to create a plan that is effective without being punitive, helping move you towards years of restful and restorative sleep. If you are searching for an experienced New York City and Manhattan sleep apnea dentist, please call NYC Smile Design at 212-452-3344 to schedule an appointment with one of our caring, skilled dentists.